Our third annual review of how they share their history on the web. When your organization presents its history well on its website, we believe that it . . . Welcomes and informs potential members, clients and donors. Shows how it has changed over the years, responding to meet new needs. Refreshes memories and warms the hearts of long-time members and supporters. Recognizes and honors the leaders and donors who did so much to advance its mission. How do Cleveland's Jewish organizations tell of their history on their websites? This page will help you find the history page on the websites of many Cleveland Jewish organizations. Click on the name of the organization to visit its website. Click on the "history" link, if there is one, to visit its History page. For your convenience, these links open pages in a new window of your browser. Close the window to return to this page. All links and pages reviewed as of August 31, 2010. If this page reports a technical problem, be assured that the organization was promptly informed. (1) The Jewish Family Services Association, founded as the Hebrew Immigration Aid Society, has been changing to meet community needs since 1875. 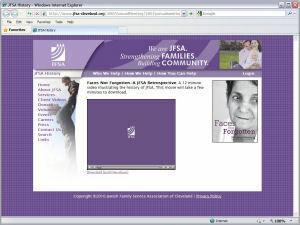 Its History page, once blank, now offers a video: Faces Not Forgotten - A JFSA Retrospective. But for those whose internet setup doesn't support video or who aren't willing to devote 12 minutes to watching the video, there is no other history - no text, no images - about the Jewish organization with perhaps the richest history of all. The video about JFSA's history must be viewed with Apple's QuickTime� software. As shown on the screen image to the right, using the latest free version of QuickTime on a PC or a Mac shows the video (dark rectangle in center) in a small window that viewers can't make larger. That's too small to enjoy the video. There are free video players (Windows Media Player � and	RealPlayer �) that allow full-screen viewing. JFSA - please change your History page so we can use them. Update: early in 2011 the page changed: eight lines of text, which read like a mission statement, not a history, were added. The video, instead of being viewable full-screen, was deleted. (2) Montefiore's 128 years and counting is a long, well-illustrated chronology since 1882. This page is well crafted and easy to read. It is a model for other organizations to follow - not just in the way it presents history, giving credit to many who helped shape it, but also in its balance between images and text and because it is being kept up to date. 2) Google cleveland federation century book. It is a pdf document. Then use the site's "search" feature, but not for history. Search for century book. A link from their History page would make it easy to find this very useful document. This page was created January 2007 and last completely reviewed in August 2010. The opinions expressed are based on my experience creating synagogue and other Jewish websites since 1998. Corrections and comments are welcome.